Samsung front load washer door not closing or will not lock? 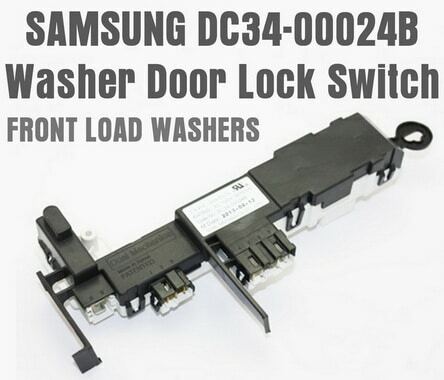 If you have a Samsung front loading washer and the door has stopped locking or closing properly, you need to check the washer door lock latch assembly. The door lock assembly for Samsung front load washers are made of plastic. If you slam the washer door or close it too hard it will damage the door lock and it may not open, unlock, lock, or close. At times the washer door may pop open during a wash cycle. Some Samsung washer owners have ran into the issue where the door locking mechanism ended up in the locked position while the door was open. Because of this the door is unable to close. If you have any issues with the door on your Samsung front load washer, you most likely need to check the door latch assembly for damage. The Samsung washer door lock latch assembly secures the washer door shut during operation. When the washing machine door is closed, the washer can begin washing. If the door lock is broken or faulty the washer door will not close, latch or lock. Unplug your Samsung washing machine. Locate the washer door latch and look to see if it is broken or cracked. If you find the door latch to be broken, you will need to order a new one. Get the part number off of the washer door lock assembly. The door latch will most likely be part #DC34-00024B or #DC64-00519B or #DC97-16899A. 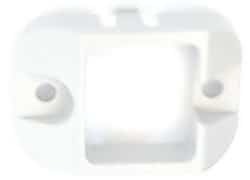 Once you have the part number of your Samsung washer door latch, order a new one online. When you receive the part, see the below video for how to replace it in about 10 minutes. Once the new door latch is installed, run a test wash to be sure everything is working properly. IF SUCCESSFUL… YOU JUST SAVED $250 ON A REPAIR BILL! The door will not open if the water temperature is over 131°F. The door will not open when the internal water sensor detects the water level is too high. Do not try to force the door open when locked as this may result in damage to the washer. 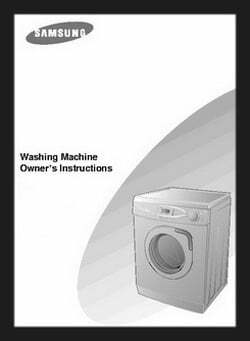 Below is the Samsung Front Load Washer Owners Manual and a Samsung Washer Quick User Guide. Both files are in PDF and can be downloaded or viewed in your browser or Adobe. 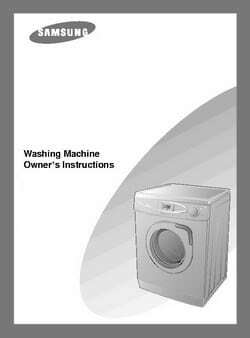 This Samsung Washer Owners Manual is in English, Spanish, and French. Unplug the Samsung washing machine. Find the retaining ring wire with the spring on it. Use needle nose pliers and remove the retaining ring wire off the door boot seal. Pull the door seal gasket out of the way (near the door switch) but do not fully remove the seal. Remove the 3 mounting screws that hold the door latch to the front panel. Pull out the door latch assembly and remove the plastic cover. Disconnect the 3 wire harnesses on the door latch to remove it. Install the new door latch assembly by connecting the 3 wire harnesses. Install the cover onto the door latch assembly. Reinstall the 3 screws to hold the door latch to the washer. Slide the door seal gasket back into place. Put the retaining wire ring and spring back on. Plug the unit back in and test it. This door latch replacement procedure will work on Samsung washer model numbers: WF350ANW, WF330ANW/XAA, WF431ABW, WF431ABP, WF340AN, WF350AN, WF330AN, WF331AN and more. Just make sure you get the correct part number off of the door latch assembly to make sure you order the correct part. Replacing the door latch on your Samsung washer will also fix the constant “click, click, click”. There are two copper leaf contacts inside the unit that make contact when the solenoid latches. If the washer doesn’t detect them it will try a few times to latch before showing a Samsung Washer Error Code. The door is actually locking but it will not detect it. 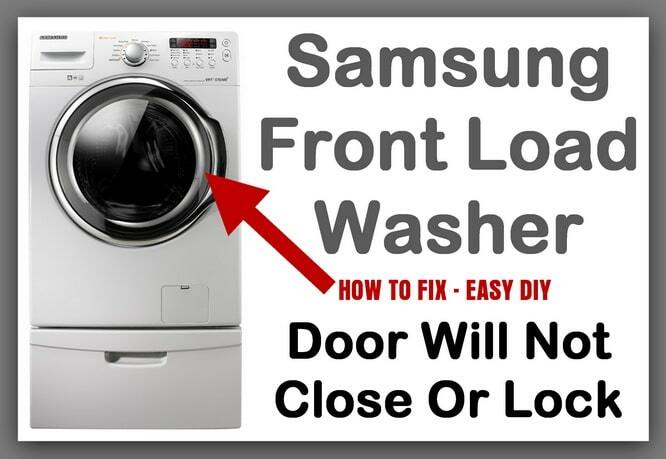 If you have any issues with your Samsung front load washer door not closing, locking, or not shutting, and you need assistance, please leave your question below and we can assist with further troubleshooting. 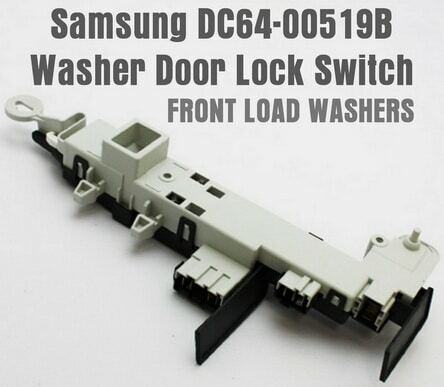 We have replaced the door lock mechanism on our Samsung wf45k6200aw/a2. For a while the click click click was happening less frequent after the repair, but it didn’t resolve the issue. When shutting the washer door, it closes, but very loosely. There are no broken parts that we can see. What else could we check on in this case? My washer door won’t close all the way sometimes or somehow opens during beginning of wash cycle. When this happens the door is open and the lock is engaged and there is no way to shut the door. I have replaced this part at least 4 times in the last 2 years, getting tired of buying them. Seems like a manufacturing or programming issue, I don’t think I should be responsible for this on a very expensive washing machine. My warranty is probably over. My Samsung front load washing machine locks and then unlocks and will not start the cycle. I replaced the door lock assembly and it still does it. On occasions it will lock and hold and run the cycle, but most the time it locks then unlocks. The white sticker on the black side of the part will have all the information needed to order a replacement. I have a samsung front load and it locks, then unlocks without washing, but the drum will spin a little bit befor unlocking! My Samsung vrt steam washer model wf448aap/xaa 01 locks at the start of a cycle then 5 seconds later will unlock., then 8 seconds later locks again. Sometimes the cycle will complete and other times the door will unlock and the machine will be idle where ever it paused in the cycle. Any help? I purchased a Samsung add wash 900 spin. when I shut the door the lock shows up but then starts flashing and won’t start. I’ve only had it for 3 months..
My Samsung front loader door will not open, there is clothes inside but it will do nothing and can’t get the door open. I ordered a new door lock assembly from amazon and successfully replaced it, however it is stuck in the locked position and I cannot unlock it by pulling the tab on the bottom. I am afraid of breaking the piece if I pull too hard. Does anyone know how to get the piece to unlock? I have no idea if the new assembly even works because of this issue. I need to know how to replace the door latch on my Samsung J845 front load washer. The door latch is broken and when I removed the door and took it apart all the parts fell out on the floor. Have have the new parts but can’t figure out how they fit together. The door will not latch. I replaced the door latch what now? My Samsung door is locked and will not open. The door latch is broken. I do not know how to open it to replace the mechanism? We have the Samsung vrt steam washer. Recently it won’t stay closed or latch when closing the door. Also, the rubber on the bottom of the opening is making a sound when we pull the door open again like the glass on the door is hitting it when we open it. Yesterday I lifted the door a little bit while closing it and it stayed closed but now that won’t work either. I replaced the latch on my washing machine WF350ANW/XAA and immediately after doing this, I was able to open and shut the door successfully. That is no longer the case. The door now seems to be locked and I can’t figure out why or how to get it opened. Is this something I can do on my own without a service call? I’m hoping since I was able to replace the latch on my own. Then remove the 4 or 5 screws that hold the front panel on they are just below the control board. You can now reach in on the right side and pull the tab down on the bottom of the solenoid switch. I replaced the door lock and switch on my Samsung Washer and the door still will not latch. Have you made sure the Samsung washer door is aligned correctly? Is the door not mechanically latching or does the control board THINK it is not latching? I discovered today that if I push and hold the door closed and then start the washer it will stay closed and locked during the washing process. So I’m thinking maybe the computer thinks it’s latching when it’s not if that makes sense. My Samsung washing machine’s door won’t unlock or open. Does it have a reset button somewhere to reset the settings? 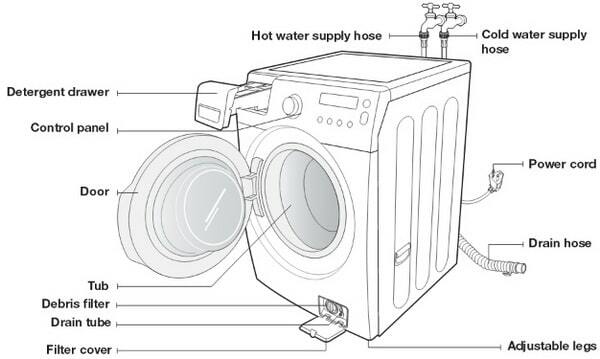 First try the simple way and unplug the washer for 10 minutes to see if it resets…. There is a small black hose with a plastic plug in the end of it. It pulls out 6 inches and you can use a pan if there is water in the tub. Run on “Spin Only” as possibly the washing machine did not fully drain and only choosing “Spin Only” seemed to force the machine to fully drain and let you OPEN the door. You may also have a burnt out interlock switch or door switch assembly issue. I have a samsung front loader WF350ANW/XAA with a new door latch and the above stated problem of “click click click” is happening from the get go out of the box. At the same time I hear the drain pump turning as if it wants to drain water. The old latch had a broken plunger on the solenoid. The error code of FL4 comes up after 7 attempts as per Samsung Tech information manual that came with the W/M. I believe the main control board will not be activated when this is happening. My front door will not close. after trouble shooting I have found that the screws holding the latch in place will not stay when I screw them in over the plastic. However the screws remain in place when I remove the entire circuit out of the washing unit. Should I buy a new latch or new longer screws or what? Otherwise I think everything else works well.